Reality meets artifice in this beguiling example of 'trompe-l'oeil'. One might even call it duplicitous, since it aims to mislead the viewer as to its outer nature and inner import. As cleverly as any artist before him and with no less attention to his craft, Rauschenberg presents a perceptual conundrum rich in potential decipherment but finally inscrutable. 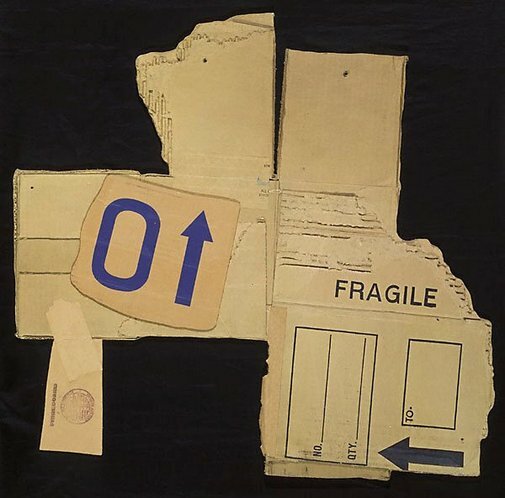 In 1971 this pioneer of American pop art exhibited a group of collages called 'Cardboards', named after the banal material he was then exploring as a medium. At the same time, he produced a number of printed simulations of these pieces, dubbing them 'Cardbirds'. This work is the sixth in that series. To all intents and purposes it is indistinguishable from the originals. Rauschenberg has even added real packaging tape alongside the photographically screened tape on the simulation. What at first has the appearance of a rather uninspired found object becomes, on closer scrutiny, an elaborate and sustaining artwork. Since the 1950s, when the young artist worked with his friend and colleague Jasper Johns, Rauschenberg has been fascinated with the nexus of high art and low culture. Signed and dated l.l. verso, ink "RAUSCHENBERG ... 71". Anthony Bond and Victoria Lynn, AGNSW Collections , 'Contemporary Practice - Here, There, Everywhere ...', pg. 229-285, Sydney, 1994, 236 (colour illus.). Bruce James, Art Gallery of New South Wales handbook , 'Western Collection: Works on Paper', pg. 79-92, Sydney, 1999, 91 (colour illus. ).